Ground beef can be combined with so many different ingredients to make delicious casseroles. This page contains ground beef casserole recipes. Brown and season beef in skillet. Peel and slice vegetables and place in casserole in layers with the ground beef. Cover with soup and water. Bake at 350 degrees F for 1 hour or until veggies are tender. Use a 2 quart casserole. It's fast, tasty, and economical. Cook ground beef, garlic powder, minced onion, and salt on medium heat until meat is cooked through, turning it so it does not get brown and crisp. Prepare macaroni and cheese according to directions. Add ground beef to macaroni and cheese. Serve with asparagus, or other green vegetable. Source: When my son was 10 years old he threw this together to surprise us and have supper fixed when we got home from work. Brown onion and meat, combine with other ingredients in a greased casserole. 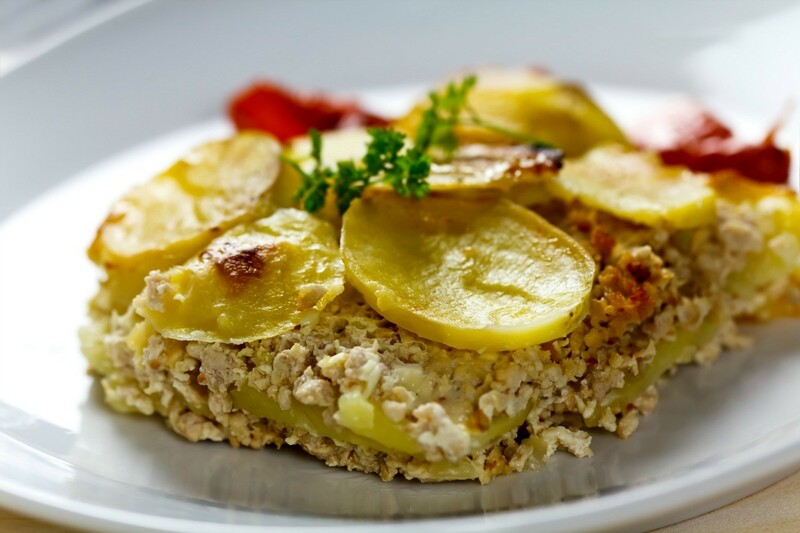 Cover with crushed potato chips. Bake in 350 degrees F oven for 1 hour. Press uncooked ground beef in bottom of 10 inch square casserole. Add salt and pepper to taste. Slice onion and layer on top of beef. Add a layer of the beans and cheese. Top with mushroom soup. Choose noodles or potatoes to use in the casserole. If you use noodles, make another layer with them between the beans and cheese. If you prefer potatoes, top whole casserole with a layer of frozen Tater Tots or frozen hash browns. Bake 45-60 minutes at 375 degrees F.
Preheat oven to 375 degrees F. Brown beef; drain. Stir in next 5 ingredients. Boil until bubbly. Pour into 2 qt. casserole. Cut biscuits in half to form 20 half circles. Heat oven to 375 degrees F. Combine ground beef, onion and bacon in 10 inch skillet. Cook over medium heat, stirring occasionally, until ground beef is browned. I'd appreciate directions for making a casserole using layered ground beef, canned corn, and onions. It can be cooked on top of the stove or oven, please. I remember this from years ago but I no longer have the recipe. It's very simple, but it fed a crowd and was a big hit. I'm sorry I don't have that recipe, but I cook something similar. I brown hamburger in a frying pan (salted and chopped up), than add in chopped onions and potato chunks. Cover and fry until everything is tender. You can also add in chopped carrots. When my kids were growing up, I had a recipe for a casserole using ground beef with a puffy topping using mayonnaise. Sounded yuck, but it was delicious. Does anyone have the recipe to this casserole dish? I don't know the recipe, but I'm thinking mixing mayo with eggs and cheese would make a nice 'fluffy' topping. Hope someone comes along with your recipe! Put on a pot of water for the macaroni and bring to a boil, add macaroni and cook according to the package directions. Meanwhile, melt the butter in a skillet. Chop the celery, onion and green bell pepper; toss into the melted butter as you go and saute the vegetables until tender. Push veggies to the sides of the skillet, toss the garlic in the center and saute for a few seconds, then toss the ground beef on top, cook and stir until the meat is browned. Meanwhile preheat oven to 350 degrees F. Push the veggies into the meat and stir to mix thoroughly. Drain off fat if needed and return meat mixture to the skillet. Add basil, salt, pepper and stir into meat and veggie mixture for a few minutes to meld flavors together. Add tomato paste, water, and bay leaf, stir together well and simmer, uncovered for about 5 minutes. Remove bay leaf and discard. Spray a 13 x 9 inch glass casserole dish with butter flavored PAM, toss in cooked macaroni. Spoon the meat and veggie mixture evenly on top of the macaroni, covering macaroni completely. Sprinkle cheese on top of the meat mixture and bread crumbs on top of cheese. Add a few sprinkles of dried parsley and Parmesan on top. Bake, uncovered for about 20 minutes or until cheese is melted.